On my 2018 1000 txt, the OEM center stand, crash bars, and Happy Trails skid plate all play well together. 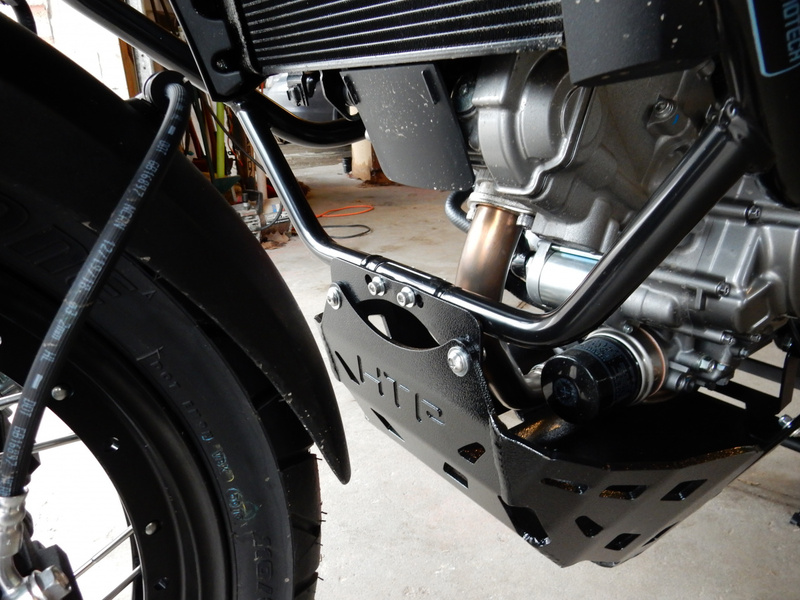 You’ll need to support the bike without the stands as the skid plate uses those mounts, IRC. I used ratchet straps to the tracks to the garage overhead door. You’re just keeping the bike vertical so there isn’t much weight on the straps. I don’t know about the Motech stand but the OEM works well. and they all work well together. OK thanks. I have a chain hoist in the garage so suspending the bike upright won't be a problem. Thanks. I went with the SW-SW-HT combo. HT verified that the skid plate works OK with the SW Motech stand. I have the SW-M stand on my 2005 and like it. 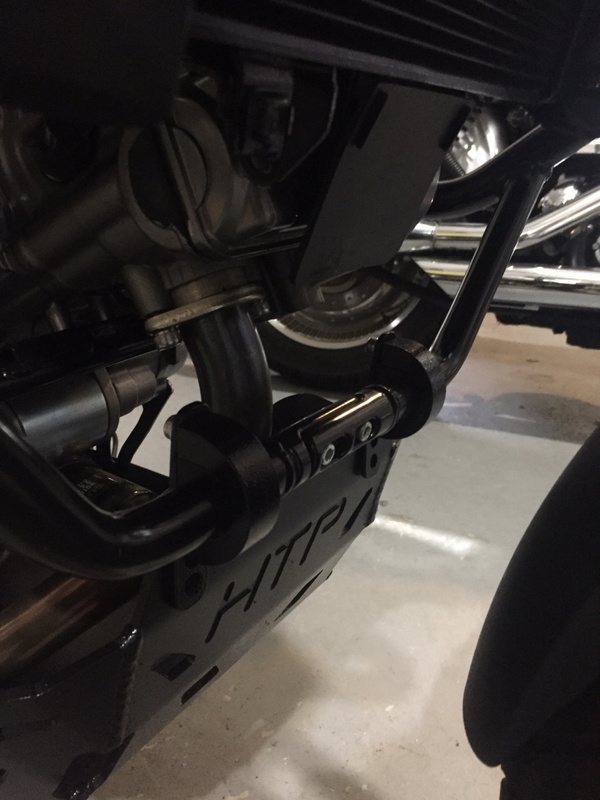 I had some trouble getting the HT front bracket mounted to the SW-M cross bar... the holes in the bracket did not line up at all with the SW-M screws. It looks like SW-M might have changed the way the cross-bar connects (the HT instructions show the old-style SW-M cross bar I remember from my 2005 setup). I drilled a couple of new holes into the bracket to line up with the SW-M screws and that worked. Last edited by Nicad; 04-13-2019 at 10:48 AM. Not sure I follow you - No drilling required here - The way my HT skid plate mounts to the cross bar of the crash bar is with a nicely lined u-clamp provided by HT - I ended flipping the mount (behind the bar instead of in front of the bar as indicated in the instructions) so I got the plate to fit closer to the motor. I may drill the skid plate to utilize the bottom holes of the bracket hardware (you can see what I'm referring to in the picture). Wow, mine looks nothing like that! No U-clamps. Looks like they sent me the previous version of the mount kit for SW-Motech. I'll contact them for clarification. I have the newer bolt-together type. 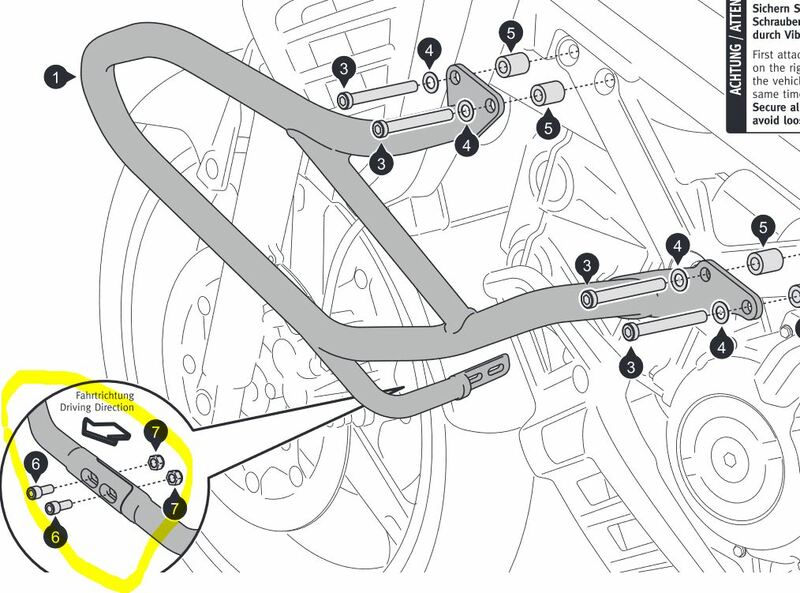 So, evidently, I was supposed to order the MK-2 mount kit for "OEM" crash bars... and NOT the MK-3 "SW-Motech" kit... for the SW-Motech bars which I have on the bike? That's crazy. I'm working with someone in customer support at HT to get this resolved but they really need to fix their website or someone else is bound to run into the same issue.